List of False teachers, religions, groups, etc. Team Jesus Preachers is a false group. This video is not biblically sound and is false. In light of Ephesians 5:11, Jude 1:3 and Romans 16:16-18, I do not encourage anybody to follow them nor spread their stuff. It is heretical and thus not glorifying to God. It is impossible to place your faith in Jesus Christ as the Savior without first changing your mind about who He is and what He has done. Whether it is repentance from willful rejection or repentance from ignorance or disinterest, it is a change of mind. Biblical repentance, in relation to salvation, is changing your mind from rejection of Christ to faith in Christ. It is crucially important that we understand repentance is not a work we do to earn salvation. No one can repent and come to God unless God pulls that person to Himself (John 6:44). Acts 5:31 and 11:18 indicate that repentance is something God gives—it is only possible because of His grace. No one can repent unless God grants repentance. All of salvation, including repentance and faith, is a result of God drawing us, opening our eyes, and changing our hearts. God's longsuffering leads us to repentance (2 Peter 3:9), as does His kindness (Romans 2:4). Amos 3:3 says "Do two men walk together unless they have made an appointment?". 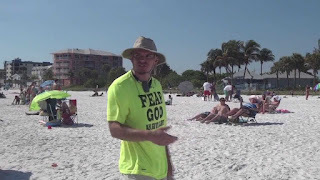 It is sad to note that the Team Jesus Preachers affiliate with and even preach with false teacher Jesse Morrell found here on his false website - https://biblicaltruthresources.wordpress.com/2015/03/10/hippie-druggies-confronted-with-the-gospel-florida-beach-drum-circle-jesse-morrell-open-air/. Jesse Morrell is a false teacher that denies that God is omniscient (Isaiah 42:9), denies that Jesus died as a literal substitute for sinners to be saved from the wrath of God when they repent and believe the gospel (1 Peter 3:18, Romans 5:9-12 ), denies that man is born with a sinful nature due to Adam sinning in the garden (original sin) (Genesis 6:5), denies justification by faith alone (Romans 3;28, Galatians 5:4), and denies that being born again through the gospel is a supernatural miracle performed by God apart from human willpower, ability, or morality (John 1:12-13). Team Jesus Preachers, I encourage you to repent and believe the true gospel or else your fate will be Matthew 7:21 - "Not everyone who says to Me, 'Lord, Lord,' will enter the kingdom of heaven, but he who does the will of My Father who is in heaven will enter." You guys are in grave sin for preaching and believing a false gospel. Anyone who is willing follow Jesus Christ must wiling to be hated of this world,and take up his cross,and follow him.These men preach the way Jesus Christ would preach today.These men have balls,which you don't have.You are a coward. God is angry with the wicked everyday.He whets , and arrows against them,all those who conceive mischief in their hearts,if they don't repent of their sins,and will wipe them out.He is loving,extremely patient,gentle,and kind,but he is also a God judgement.Do you love your sin?The bible says be yenot comformed to the ways of this world,but be transformed be he transformed by the renewing of your in Jesus Christ.Don't partake of the unclean thing.flee all sin. Hey Cash Willis,what did Jesus Christ preach mostly on?Did he not preach repentance, and obedience?YES by faith,and Grace in Jesus Christ we are saved.He said straight is the gate narrow is the way few which be there at.Broad is the toward which many be there, at fore many are called but few are chosen.That means only those who are on the narrow road will make it to heaven.Meaning those who accept Jesus Christ as Lord , and savior, and repent of their sins shall be the ones that go to heaven.The bibles says liars,thieves,murders,whoremongers,sorcers,prostistutes,idolaters,extortioners,wizards, of perverse imaginations,adulters,effeminate,all who are abominable, shall not inherit the kingdom of heaven, but shall perish eternally.But only those who accept Jesus Christ ,repent of their sins,endure trials,tribulations, and persecution shall inherit the crown of life!The bible says if we love we will keep his commandments.Jesus Christ didn't die on the cross so we can continue in our sin.If we love we will desire to be perfect as he is perfect,and be holy as he is holy.How can we honor him if we choose love like a devil?Say we know Jesus Christ but our works sent him?Aren"t we bring hypocrites?Take your cross, and follow him!He that is not willing to take up his cross,and follow is not worthy of him.If the the salt has lost its saviour what good is it.His hates what you are preaching! You are of the devil,and after his deeds you will do.You need to stop preaching false doctrine,telling them they can going on sinning willfully , and forgetting why he saved us so we can be free from be sin,and be holy,be righteous,become saints.You are fleecing his flock.You need to repent,and teaching false doctrine which is called is easy beleivism.Which totally ignores who the true Jesus Christ of the bible is.I question if you are even a Christan. @IsaacRomero Team Jesus Preachers preach a false gospel that lead people to hell apart from God for eternity. Jesus Christ never preached what these wolves in sheep clothing preach. Anyone who preaches a false gospel let them be accursed- Galatians 1:6-9. For you to say these ravening wolves preach the true gospel is evidence that you do not serve nor know the true Jesus Christ of the Bible. For your information, I do herald the gospel on the streets for God's glory. The difference between me and the false group team Jesus preachers is that I preach the true gospel according to scriptures and I don't lie and twist scripture on what repentance is. For you to call me a coward is inaccurate and a lie. Liars will not inherit the kingdom of God Isaac- Revelations 21:8. Isaac nowhere in this article was it denied that God is holy, just etc and that he hates sin and the sinner. The scripture clearly show that God has a holy hatred for sinners e.g Psalms 5:5. But thank God for Christ, he has a holy love for sinners too - Romans 5:8. At the cross we see God's justice, mercy, holiness, grace, love etc through Christ. Your belief that repentance means turning from sin is false and unbiblical. Turning from sin is not repentance, it is a response to repentance. Matthew 3:8 and Acts 26:20 show this. I never said in the article that once you get saved you don't need to obey God. You have clearly lied and misrepresented the biblical truth I communicated. People do not stop sinning to get saved. They get saved and then stop sinning. Nowhere in the Bible does it say once you are saved you are to continue in sin . Romans 6:1-4 is clear on this. A person is saved by faith in Christ and his finished work on the cross alone. John 6:26-28 and Galatians 2;20-21 is clear on this. You have resorted to lies like your father Satan to say I preach people can go on sinning once saved. Isaac, you are not a Christian and you are in danger of hell apart from God for eternity. You promote and believe a false gospel- a gospel based on works which are filthy rags before God. Repentance is not turning from sin, it is a change in mind . Turning from sin is a response to repentance and faith in Christ- Acts 26:20. You falsely believe a person is saved by obeying God(works). Nobody can obey Christ perfectly to save themselves. We get saved then obey not obey to get saved. Re-read the article again, your allegations are false. Isaac ,you believe in a salvation of works and you have fallen from grace. I am not saying you have lost your salvation(which you cannot lose - Ephesians 1:13, Philippians 1:6), I am saying you never had salvation in the first place because you believe a false gospel- Galatians 5:4 You need to believe the true gospel and let go of all your faith in your worthless works to make you right before God. He died on the cross a death He did not deserve, taking upon Himself the punishment you rightly deserve, for your sins against God.Three days later Jesus forever defeated sin and death when He rose from the grave, and He is alive today.What God requires of you is that you repent (turn from your sin and turn toward God by changing your mind)and by faith alone, receive Jesus Christ as your Lord and Savior. Repent and believe the gospel, while God has given you time. You guys are crazy If you say team Jesus preachers don't preach the gospel. All they do is quote bible verses. Obviously you are not Christians if you don't believe God's word. Shame on you. May Jesus show you the light! 2 Corinthians 10:5 says "We are destroying speculations and every lofty thing raised up against the knowledge of God, and we are taking every thought captive to the obedience of Christ," We are a group of Christians dedicated to spreading the true gospel of our Lord Jesus Christ in correct knowledge for his glory. We seek to do this by actually spreading the gospel and pointing out false doctrine as the Lord calls us to do in Ephesians 5:11 and 1 John 4:1.